Brazilian Jiu-Jitsu (BJJ) is a highly effective martial art for men, women, and children for both sport and self-defense. It was initially designed as a self-defense system, a combat art, for the smaller person using leverage against a larger assailant. This is important because not everyone is equipped with the strength or athleticism to overpower someone in an altercation. One fact that remains true is that most altercations end up on the ground, which is why BJJ is one of the world’s most effective martial arts, and has even been battle-tested in events such as the UFC. With that being said, in order to train and learn, the beauty of jiujitsu is that you don’t have to be a professional power lifter, a collegiate wrestler, or a natural athlete – you just have to show up and train. Our curriculum is structured for progression through all skill levels from beginner to competitor, so if you have no experience, our level 1 classes are perfect for you. BJJ is a very versatile martial art – At Combat Arts Academy, you aren’t just learning self-defense. You will also get into fantastic shape, and become a part of an amazing community. Our program focuses on all of the benefits that BJJ offers. 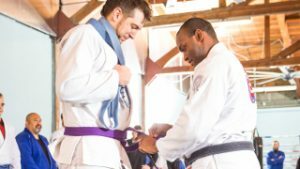 We provide a fun, clean, and safe environment that introduces students to the principles, theories, and techniques of BJJ, for all ages and all skill levels. Regardless of your goal, you’ll be surrounded by like-minded individuals enjoying the physical and mental challenge of what the art of jiujitsu provides. We offer a variety of classes for all ages, genders, and skill levels. Our mats are packed with students, professionals, stay-at-home moms and dads, and everyone in between with the common goal of learning Brazilian Jiu-jitsu. We provide a fun and safe environment that caters to everyone’s needs. 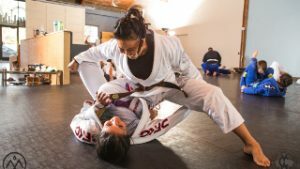 Although Brazilian Jiu-jitsu is the best form of self-defense and a great way to get into shape, it’s a male-dominated sport and can be intimidating. Because of our safe training environment and coaching, we encourage co-ed classes, but this is why we offer women’s only classes taught by women. 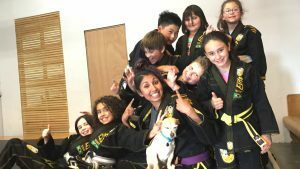 Combat Arts Academy of Seattle’s youth martial arts program is designed to help your child improve focus, self-control, discipline, and develop a positive self-image within a fun, safe, and family-friendly environment that emphasizes goal setting and achievement. We don’t just focus on the techniques; our kids classes also focus on life skills to be amazing human beings!